'Tis the season to make your list and check it twice! I'm talking about Christmas shopping, of course. Whether you're searching for the perfect gift, finding the finishing touches for your party decor, seeking holiday attire inspiration, or buying some warm winter things to bundle up in, be sure to check out these events happening in the next few weeks. Some of Gastown's most fashionable boutiques will be open late for one night only, offering discounts, drinks and nibbles to shoppers hopping from shop to shop. Be sure to check out a few of my favourite stores: LYNNsteven, Ishara, (212) and Rowan Sky. For more information, check out the event listing here. 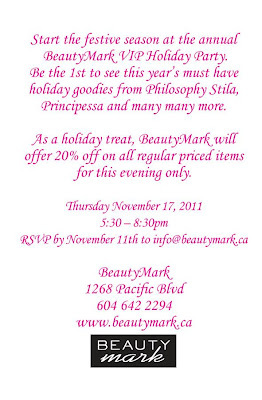 Scope out the latest beauty goodies from Philosophy and Stila, stock up on moisturizing skincare to battle the elements, and pick up a gift or two for the beauty lovers on your list--all while enjoying a 20% discount on regular-priced items. See the flyer above for all the details. 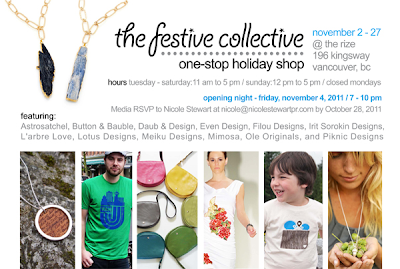 This month-long pop-up shop in the Rize showroom (196 Kingsway) offers an eclectic selection of clothing and accessories from some of Vancouver's best emerging design talent. Be sure to check out the sterling silver and laser-etched wood jewelry by my friend Fiona Louie. For more information, check out the flyer above or their website. The Le Chateau location at Pacific Centre is hosting a holiday party wear event this Saturday in collaboration with stylist Luisa Rino of FLARE magazine. If you're weary of duking it out with frenetic shoppers over pieces from the Versace x H&M collaboration, stop by for Luisa's presentation on holiday wear ideas and enjoy complimentary nail and hair touch-ups by Suki's salon. 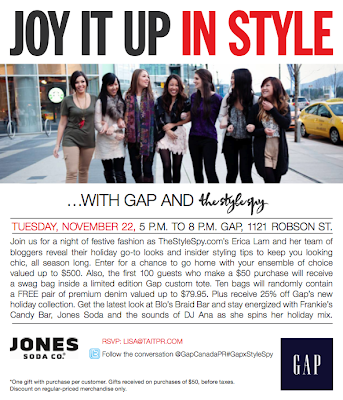 The Style Spy and the Gap on Robson Street team up to present a fun night of shopping. 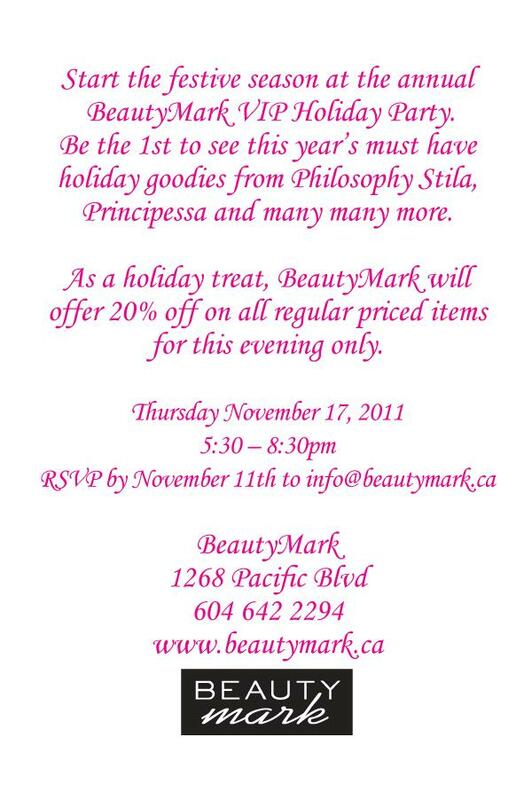 25% off the holiday collection, a braid bar and candy bar, DJ, and gift bags for purchases over $50. 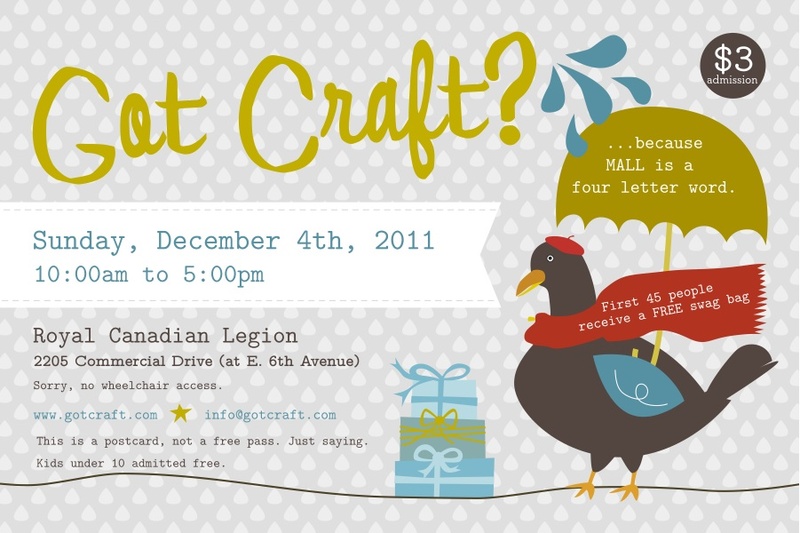 See the flyer above for all the details. Join VitaminDaily.com's co-founder/editor-in-chief, Sarah Bancroft, as well as gorgeous bloggers/Vitamin Daily contributors Anya and Kelsey at the Banana Republic Robson flagship and enjoy 25% off the new holiday collection. Get help for your holiday party wear conundrums and search for the perfect cardigan for your beau. See Anya's blog post for all the details. Probably the most indie of all the indie craft fairs in Vancouver, Got Craft returns to the Royal Canadian Legion for one day only to purvey all things handmade. One of a Kind Vancouver is like a one-stop shop as far as unique gift ideas go. Think dinnerware, food items, decor, art, clothes, jewelry...you can find anything and everything at this huge show taking place in the Vancouver Convention Centre. (I was lucky enough to get a sneak peek at what's in this year's show earlier this year.) If you, like hundreds of others, are after some Coach shortbread, go on the first day and go early; they've been known to sell out in the first few hours. As I said last Thursday, I am SO impressed at your ability to balance your life with work, salsa, blog and events! Thanks for filling us in with all this local holiday fun- hopefully I'll see you at some of them soon! Hope you are having a great week Lisa! hooray for holiday shopping season. 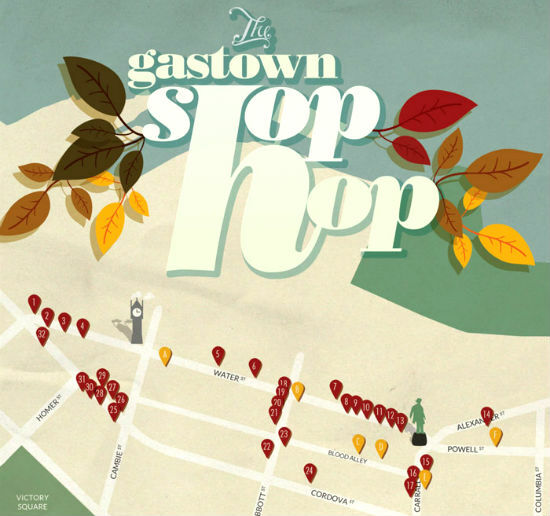 Hope to stop at shophop after house guest party tomorrow night. Thanks for including Banana Republic! Hopefully, I'll see you there.